Custard apple (Annona squamosa) is a genus of Annona and a native of the tropical Americas and West Indies. Some of the other trees widely grown are Annona reticulata, Annona cherimola (cherimoya) and Annona scleroderma. Detailed step-by-step information on growing custard apple in container from seed is given and taking its care, when it is ripe and how to eat it. The tree is evergreen perennial in Mediterranean to sub tropical climates and semi deciduous in cooler climates, reaching 10m in height. Custard apple is widely grown in India and South East Asia . The fruit varies in shape and color, spherical through conical, with a thick rind composed of knobby segments. The color of custard apple fruit varies from pale green through blue-green. When ripe, the segments of the fruit separates quite easily when lightly pressed between hands, exposing the flesh. The creamy texture of the flesh gives the fruit its name, custard apple. The fruit is very sweet and delicious that can gives you a range of health benefits. Custard apple is an good source of vitamin C (anti-oxidants) , fiber, vitamin A, B2, B3, B5, B6, iron, manganese, magnesium, phosphorus and potassium. Potassium and magnesium protect our heart and control blood pressure. Custard apple is safe to eat in pregnancy also. 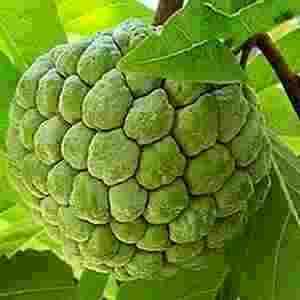 There are some custard apple fruits which are small in size and contain lots of seeds with little to eat. On the other hand, there are some custard apple varieties, which produce large fruits with only 5-7 seeds and all flesh to enjoy. There are two main varieties of custard apples; both are sweet, juicy and flavored . Just cut them in half and scoop the flesh out with a spoon and enjoy. Pink Mammoth (also known as Hilary White): The fruits are very large (up to 3kg) of high quality and have very less seeds, almost seed-less. This is the most popular variety for commercial production of custard apple. African Pride: The fruits are smaller (500 - 800 g) and have more seeds than the Pinks Mammoth. They begin to produce fruits earlier. It is prone to skin blackening and other fruit problems. The Australian custard apple is hybrid between sugar apple (Annona squamosa) and the cherimoya (Annona cherimola). The variety Tropic Sun is a small tree suitable for home garden with excellent fruit. Whenever I used to eat a custard apple, I always thought whether it would be possible to grow custard apple from seed. I thought, the tree would take several years to produce fruits and only the custard apple plant propagated from a cutting can produce fruits in a few years, so I didn't try. But recently, I came to know that a new custard apple tree grown from seed will bear fruits in 2 to 4 years, so I decided to try to grow it from seeds. Propagation of sugar apples is easy and involves a few simple steps. Given below is a step-by-step guide on how to grow custard apple plant from seeds in a pot. Growing of custard apple is highly dependent on climatic conditions of temperature and humidity . Plant in a warm, wind-free, frost-free and high humid side of the garden. At temperatures above 28°C, the custard apple tree will produce more growth and fewer fruits, while at prolonged temperatures below about 13°C during the fruit growth, the fruit may develop skin discoloration and splitting. Avoid dry areas where relative humidity during fruit set may go below 70%. Frost can kill young and fruit bearing trees.It is not possible to grow custard tree indoors. The custard apple seeds are very hard, so they require some preparation before sowing. The success of growing custard apple from seeds depends greatly on proper seed preparation before sowing as the seeds are very hard. The seed is prepared by soaking in water. I collected 7 large size seeds from a very sweet custard apple bought from a grocery store. I soaked the seeds in water in a cup at room temperature for 4 days. On the 5th day, I took out the 4 seeds that were sitting at the bottom of the cup and placed them on a paper towel to air dry. I threw away the 3 custard apple floating seeds, which are not good for germination. Take a small pot and fill it with a well-draining soil. You can either use a seed raising soil or make your own. Sow the seeds about 1 inch deep keeping about 2 inch separation between them. I mixed potting mix with river sand in equal amount and filled the pot, leaving top 1 inches empty. I placed the 4 seeds on the soil and fill the pot with the soil. Water well and place the pot in indirect sunlight. Keep the soil damp as the seeds germination require humid and warm environment. The custard apple seeds germinate quickly (about 3 weeks) in temperatures between 18 and 25°C (64 and 77°F). However, in the varying climate of Sydney, my seeds took almost 8 weeks when 2 out of 4 seeds germinated. Keep the soil damp by giving water to the developing root system daily. When the seedlings grow to a height of 3-4 inch, it is time to transplant them. Sandy loam soil is the best for custard apples, so dig the ground about 1 meter deep and add ample river sand and compost in it to ensure good tree growth. Soil with rocks or too much clay will cause the root rot. Avoid soils that have previously grown ginger, eggplant, capsicums, tomatoes and potatoes to avoid bacterial wilt disease. Tap the pot from all side to make the soil lose and take out the saplings carefully without damaging the roots. Plant the saplings in a small pot filled with well-draining soil. Make the soil by adding river sand (25%) and compost (25%) in potting mix (50%). Place the planted pot in indirect sunlight for at least 4 weeks, or until the root system is strong enough to transplant the tree to its permanent position. If growing in a pot, do not plant the sapling in a very large pot. Start with a small pot and transfer to the next pot size when the roots start to emerge from the bottom holes of the pot. This way the plant will be always in a fresh soil getting the needed nutrients. Always put the pots in a warm position protected from winds. Select the warmest frost-free side of the garden which is most protected from winds. This will protect the soft brittle wood of the tree which is extremely susceptible to wind damage. If you want to grow custard apple in ground, dig the soil to 1 m depth and break any heavy clay and chunk of soil. Add river sand and compost to avoid root rot; and transfer the plant. Whether you grow your custard apple in a pot or in ground, you should apply a thick layer of organic mulch to preserve humidity in the soil. Pinch the growing ends of the branches to make the tree denser. Winter is the best time to prune the branches of the custard apple tree, however, only a light pruning is needed. Water regularly when the trees are actively growing and flowering. Under watering the tree can cause fruit to burn in direct sunlight, while over-watering can lead to root rot. During the winter, when the tree becomes dormant, they do not require regular watering. Mulch tree and prune tree in Spring to open vase shape. Fertilize well after fruit set with organic fertilizer. Regular watering commencing at flowering to harvest is important. Custard apple will bear fruit in 3-4 years. Some species start flowering at young age within 1-2 years from seed. The custard apple plants bloom in spring to summer producing greenish-yellow trumpet shaped flowers that emit a pleasant sweet smell,. The flowers are protogyny or protogynous. In the protogynous flower, A single flower first opens as female flower and then becomes male flower after 36 hours. The female reproductive organs (carpels) mature before the male ones (stamens) so flowers are almost never pollinated by their own pollen. Only a small number of flowers set fruit by themselves. The custard apple flowers are, therefore, hand-pollinated by collecting the male pollen and pollinating the female flowers. Collect opened flowers and store in a paper bag. They will shed their pollen, apply them onto newly opened flowers which are female flowers, using a small paint brush. It is better to have two trees to increase the chance of pollination. The outer of the fruits are covered in rounded knobs, while the inside contains a custard like flesh. Custard apples have fewer serious pest and diseases , so you can grow custard apples with no or limited use of chemicals. Aphids and mealy bugs may be a problem, which can be controlled by lacewing and other predators, without any chemicals. You can use fruit fly traps when numbers begin to build up. Custard apples can be grown organically. Use a balanced fertilizer or citrus fertilizer every three months until the tree begins to bear fruit. Feed sulfate of potash or comfrey tea to increase flowering. Custard apple trees are sensitive to frost. You can protect the tree by wrapping the trunk with foam or similar material. The whole tree can be protected in winter by enclosing the tree in a tent. How Do You Eat Custard Apple? When you buy custard apple from market, it will be unripe and quite quite hard. Place the fruit on kitchen table for 2-3 days to ripen it. When the custard apple fruit ripens, it will of pale or dull green skin and soft to touch. To speed up the ripening process, you can place it with a banana in a paper bag. The best way to eat a custard apple is to take a ripe fruit and cut it into halves or 4 pieces. Take a spoon and scoop out the flesh and eat, spit the seeds. Can You Eat Custard Apple Seeds? The seeds of custard apple are toxic and mildly poisonous in nature, so you should not eat them. I wanted to share what I did to speed up germination of the sweetsop seeds I saved from fruit I bought. I scarified the seeds by filing their edges. I first cracked open one seed as a test to get an idea how thick the seed coat was. It's quite thick so I filed enough away to allow water to penetrate faster and soaked in water for a day. I then laid the seeds between a folded up wet paper towel that I placed in a small unsealed ziplock plastic bag to provide both air and retain moisture. That was about 1 1/2 weeks back and I see some are just starting to sprout. Tomorrow, I'll plant those sprouting.